WELCOME to our home in "The Woods"! Nestled among trees, this townhome is a modern, ski cabin with the amenities of home. It’s in a quiet, convenient location immediately next to the golf course on a spur of the Whistler's Valley Trail System, and only a 5-minute walk to Lost Lake. The living room has a wood burning fireplace to cozy up to after a day of exploring the mountains, in-suite laundry and a large balcony. The master bedroom features a Queen size bed with en-suite bathroom. The second bedroom has two twin beds and a full bathroom across the hall. While the living room sofa is not a sofa bed, it is comfortable enough for a plus one, if needed. The mudroom has a ski rack, space for hanging wet gear, and the base heater dries soaked gloves quickly. The kitchen is equipped for cooking full meal or just a quick breakfast. The complex has a common area hot tub and free underground parking for one car. In the winter, the slopes are easy access with the complimentary Village Shuttle that stops at the driveway and brings you to the ski lifts at Blackcomb Daylodge (to the Wizard Express lift; or the shortcut ski-in at Coast Blackcomb Suites). And, depending on snow conditions, you can ski directly home. For slower paced days, there’s miles of XC ski around Lost Lake on the Nordic trails; and snowshoe too, beautiful day, or night. The village shuttle is always free, so easy to get to village shops, restaurants and nightlife. In the summer, if you’re not ripping the downhill park, the mountain biking around Lost Lake can keep you riding for hours. The area is equally delightful for hiking, golf and swimming at the beach nearby at Lost Lake Park. The Upper Village has the Family Adventure Zone, a short walk away, where children, and adults!, can get on bungee trampolines, mini golf, go-carts, mazes, batting cages and more! The Whistler Farmers market is also held every Sunday in the same location. For those open to a comfortable pace, Whistler Village is only a 20-minute walk on the trail through forest and over a small river. Currently we do not charge extra for cleaning fees. However, to comply with Canadian taxes, we add approx 10% of your total rental payment. This is because we are responsible to pay a total of 16% of the final deposit to us. The total taxes collected includes a) 5% for the Canadian Goods Services Tax (GST), b) the BC 8% Provincial Sales Tax (PST), and c) 3% for the Municipal and Regional District Tax (MRDT) collected for the Whistler Municipality. These taxes are separate from the VRBO service fee, transaction fees, and taxes they collect. Yes, it's a fee pandemonium here. Our apologies. Well equipped - great location, spacious. Loved the condo, very well equipped. Shuttle service was excellent. Would have given 5 stars if beds were softer and allowed to bring drinks into hottub area. Jane and Kelvin have a beautiful 2 bedroom, 2 bath in The Woods. We loved that there was covered parking, a jetted tub, the laundry, convenience of the free shuttle, and the great mudroom for all of our ski gear. The community's hot tub was perfect and rarely crowded for us and we appreciated the cozy blankets in the condo to stay warm. Check in was easy and overall communication was great. Highly recommend. This nicely laid out two bedroom was an excellent choice for us. It was a quick walk to the free Whistler Village Shuttle service that ran every 8-10 minutes. We seldom waited more than 2. The unit was spotless and had every kitchen item one might need if cooking at home is your interest. The hot tub was excellent and only 30 seconds from the unit. This was our first venture in such accommodation after years of staying in various slopeside ski in/out locations. This stay in this unit has easily changed our thoughts on that and we look forward to an opportunity for a return visit next season. 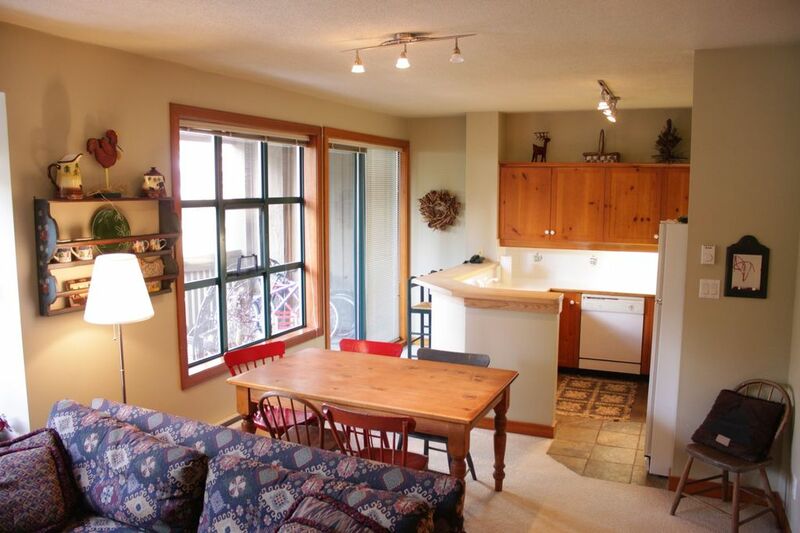 Quiet mountain condo with easy access to mountain and village. This property has everything you need for a four person stay. The property is clean and well-maintained. All the amenities are available. The free bus shuttle stop is a short walk. Covered parking is available. We enjoyed our stay. So pleased that your stay was enjoyable!